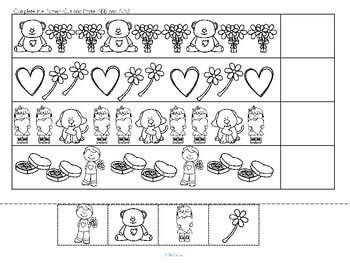 Use these patterning printables to make hands-on centers and games to complement your daily lesson plans and curriculum for preschool, pre-K, Kindergarten children. Many printables on this page are free. Some are for site members. Download instantly, in Adobe PDF format. More math activities and printables: Numbers and Counting, Shapes, Categorizing and Sorting, Graphs and Measurement, Tracing and Writing Numbers, and Math Songs and Rhymes. Complete the pattern by circling the correct shape. Draw and color the correct shape in the space. Cut and paste the shapes to complete the patterns. Cut and paste to make 3 in a row. Draw the correct shape in the space. Draw the correct shapes in the spaces. Write the correct letters in the spaces to complete the pattern. Cut and paste the letters to complete the patterns. Write the correct number in the space to complete the pattern. Cut and paste the numbers to complete the patterns. Write the correct numbers in the spaces to complete the pattern. Color the paint splats to complete the pattern. Cut and paste to complete the patterns. Cut and paste to make 3 in a row of each color. Christmas theme simple cutting practice and making patterns. 8 pgs. Winter theme simple cutting practice and making patterns. 8 pgs. Candy canes - complete the color patterns. Valentine's day cut and paste patterns printable.